For a bright and beautiful German Iris that fills the midseason landscape with color, look to Twist of Sheree. 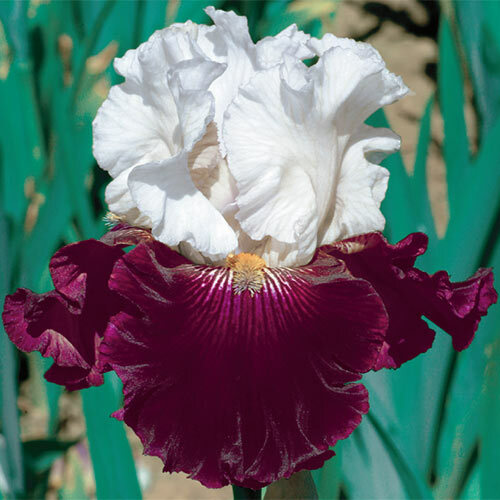 This modern iris cultivar features a well-branched, floriferous habit that produces plenty of 4½" blooms-enough for your customers to enjoy both outdoors and in. Each gorgeous flower is made up of velvety, deep purple falls below icy white standards washed in soft, light lavender. Just a few blooms transform a ho-hum bouquet into a designer-inspired arrangement that's sure to turn heads. Planted outdoors, such as at the back of a sun-filled border, these 29" tall irises look over more diminutive plantings, and add so much interest to the area. Twist of Sheree perennializes well, dependably reappearing in the landscape year after year. 41/2 to 5" flowers are fan-shaped, with three drooping petals called falls and three upright petals called standards. Well drained preferred. Quite tolerant of a wide range of soils. Avoid water-logged soils.